One can avail a wide array of Straight Boom Lifts that are known for their longer shelf life and corrosion resistant nature. Straight Boom Lifts are manufactured by our vendors using advance technology and available in different sizes. Further, the offered Straight Boom Lifts are constructed as per the requirements. Karan Infra Solutions was established in the year 2011 in Andhra Pradesh, India.Karan Infra Solutions is basically a sole proprietorship based company. 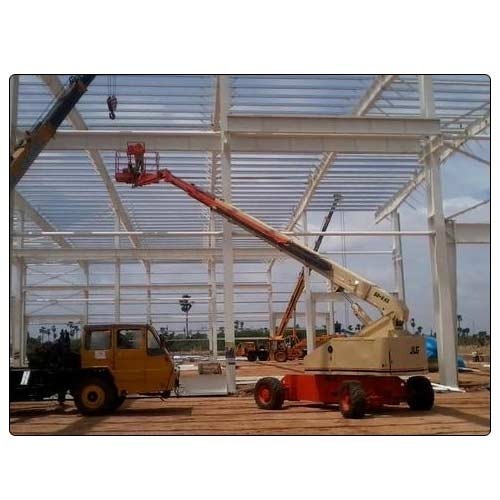 Karan Infra Solutions is known as the prominent supplier and trader of Scissor Lifts, Straight Boom Lifts, Articulating Boom Lifts and Hydraulic Cranes. The offered products are manufactured by our certified vendors. They are known for using high grade material while manufacturing the products and provide a wide range of quality products. The products offered by us are known for their hassle free performance and extensively used in various suitable applications. Further, the offered products are available in market in bulk and customers can avail these products from us in different sizes. Further, our team strives hard to meet the huge market demands and satisfy the specific requirements of the customers. By providing best quality products to customers, we have maintain a trust worthy relationship with our customers and as well as with other organizations. There is a transparency in our every business deals with our prestigious patrons.